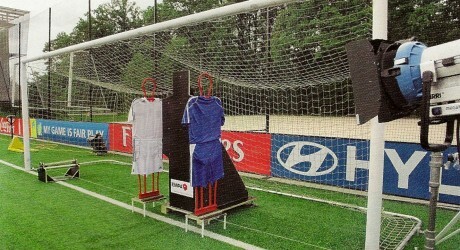 Testing one of the goal-line technology systems. FIFA World, April 2012, p. 13. (Earlier versions of the this article appeared in the Geelong Advertiser, Goal Weekly and Neos Osmos). A referee gets a decision wrong. Perhaps. His supervisor does not think he did, even if the rest of the world, having seen a video replay is convinced otherwise. Does this mean football should succumb to the clamour for the introduction of technology to second-guess the officials in football matches? The case is not clear cut and arguments against going down this road are very strong. Technology only shifts the locus of decision-making, it does not improve it. What was once a decision of metres becomes one of centimetres. You might make a case for photo-finish cameras at the end of horse-races where the gambling of millions rests on the result. But in contact sports and flowing games it is less justifiable. The area of doubt narrows apparently. But then you just argue over millimetres. Is this an improvement? Artefacts like Hawkeye and Snicko just appeal to gullible folks who think they are seeing something closer to the truth, when they are only witnessing projections of possible trajectories given a whole range of untested assumptions. These include round tennis balls with no fuzz, smooth edges on bats, balls with no seams, which do not deviate in flight. Not only that but the presentation on television undermines umpires and referees who are second-guessed by others. If the technology could give the football referee in charge an instant and accurate replay to a hand-held device in real time within a second of the incident so that he or she could review anything about which he had doubts, allowing the game to flow, then it might be worth considering. Even then I’d be doubtful. FIFA’s International Board is considering two systems for goal-line decisions only. One uses cameras the other a micro-chip inside the ball and sensors. How the latter will go after being kicked around a pitch for up to 120 minutes plus penalties and in half-a-dozen balls is a concern. It must be robust, says FIFA, and then some. The costs of these systems will be significant which means they will only be used in big games, destroying the notion that the same laws apply everywhere. FIFA insist that the system will provide information to the referee so that his or her decision remains final and the material would not be broadcast. I think it will be impossible to hold that line since everyone will want to know what the decision was based on. In football the extra official behind the goal line miked to the referee with a remit to decide on the ball crossing the line and shirt pulling in the penalty-box at corner kicks would, to my mind, be more effective. FIFA says it will decide on goal-line technology at the meeting of the International Board in Kiev on 2 July 2012, and it will then be up to organisers of competitions as to whether they wish to adopt it. But FIFA is likely to use it at the club world cup in December if the Board gives the all clear. The other strike against technology for football is that if you introduce it for goal-line decisions, then as Sepp Blatter the head of FIFA and others have pointed out, you lose the present rule which applies universally to the simple game throughout the world where the referee makes the decisions in real time. It will become harder if not impossible to prevent extending the nonsense to penalty decisions, offsides and everything else. The game will become staccato and opportunities for advertising to fill the gaps will kill the game. Beware of what you wish for and think through the consequences. The AFL example from last weekend shows that reviews are seldom conclusive. Did the ball touch the Collingwood player’s hand after coming off his leg for the final, decisive point in the Anzac Day game with Essendon? What about the earlier one which was deemed a point after it did or did not hit the post or was touched by an Essendon defender. Debate continues on both of these long after the reviews have been exhausted. Did you notice that the referees at the European Champions League semi-final second legs, one experienced, the other virtually new to this level, got virtually everything right, including incidents behind play. Who needs technology when you have competent performers in the officiating role? I remain a believer in an imperfect world in which the impossible is done every day. For example, offsides are given by linesmen who are physically incapable of having one eye on the kicker deep in own half and the other on the attacker and the defenders in the other half, as a Spanish doctor proved. Unless you have two cameras in line with the ball and the attacker and split screen and probably a time code, you are not going to get any better decisions. Probably not even then. Keep technology out of football.